ON THE SIXTH DAY OF JULY, 1893. This foundation stone of the present Town Hall stands at the junction of St Aldate’s and Blue Boar Street. It weighs half a ton, and unfortunately had to be laid twice. 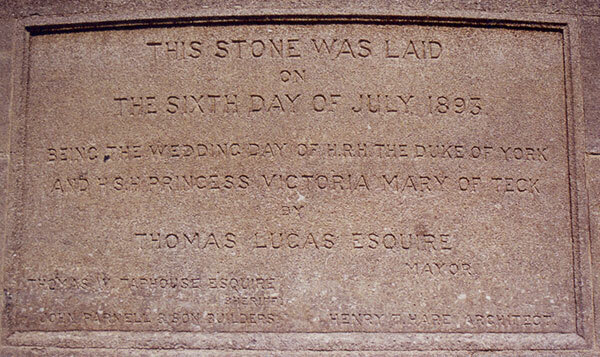 It was ceremonially laid by the Mayor Thomas Lucas on 6 July 1893, the wedding day of the Duke of York and Princess Victoria Mary of Teck, as recorded on the inscription, and at that point it had the name of John S. Chappel of Pimlico as the builder engraved at the bottom left . He went bankrupt just three months later, and because the stone had to be changed to give the name of the new builders, Parnell, it had to be relaid. The Town Hall was opened nearly four years later on 2 May 1897.